Finally! The internet is set up in my new apartment and I feel like it's a miracle. I know. Sad. Very sad but also true. I had to utilize all of my online time whenever I was on campus this last week so that meant my internet time had to focus around homework and the school newspaper articles I'm working on. But now that I have internet at my apartment, so I can procrastinate all I want whenever I want! Ha, just what I need. I figured I would return with a outfit post for you guys. I wore this when I was at home getting my things together to bring to the apartment in Philly and I've decided that the no white after labor day rule is ridiculous. Especially when it's 93 degrees and super sunny out on this mid-September day. I'm not saying good-bye to summer clothing until September 21st for sure. I'm soaking up every bit of summer that I can. Which means I will continue to mix together bright colors and wear white dresses for the next week and a half as much as possible. Totally ridiculous rule!!! I love this dress and fully support your wearing it after Labor Day! Wearing white after labor day, you rebel! I love this look. That dress is adorable! Even the band-aid on your knee looks great. haha. gosh, you're so pretty dear! i love this white dress paired with the other colors of your shoes and necklace. so cute! I love your dress Chelsey, you look so pretty. I love your blog, I am following you. Love your blog! And I totally agree with you. I wore white jeans and a chambray shirt the other day, and just so did not care about any silly rule. It's still crazy hot out there! The no white after labor day rule is definitely ridiculous! You look gorgeous! 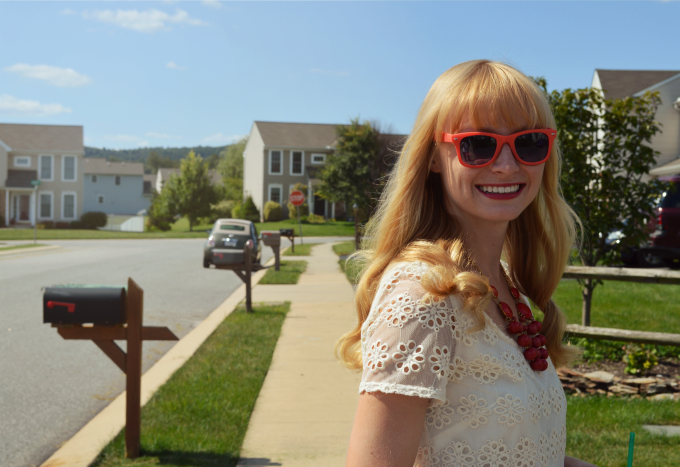 The pops of red in your necklace and sunnies are perfect. I get such a lovely Mad Men feeling from this. Gorgeous smile. If it is still going to be summer hot, you can still wear white. Plus, I am a huge fan of eyelet lace so I say wear this dress as long as you can. So cute! Love love love the shoes! I love your dress, and your shades, and your hair :) and yeah I can see Derek really clearly in your glasses. Hi Derek. This is such a lovely dress, you look beautiful! And I adore the savvy styling. Thanks for lending me your opinion on my last post. Happy End of the Week! These are very bright and happy photos! you look so pleasant and friendly!! it's so refreshing to see you and your smile!! and can i just say that your neighbourhood looks so perfect!! it's like one in the movies!!! Love how you paired the white eyelet dress with such bright, contrasting colors. The lipstick looks gorgeous as well! The houses in the backdrop complement the outfit. Love the dress. Thanks for posting and feel free to drop by me too anytime. your hair is unfairly beautiful! your blog is gorgeous.